Can a man fall in love with a path? 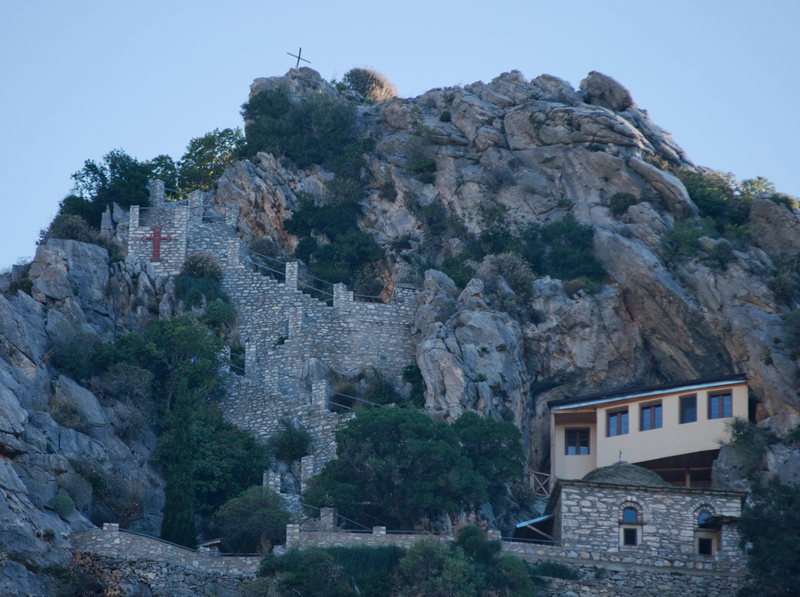 The closest you can get is walking the paths of Mount Athos. The beauty lies not in their youth. These paths are ancient. They plunge you into history. They make you wonder about their history, of all the people who traveled these paths. They are the lifelines between human settlements, monasteries or skitis. They are essential for communication and transportation of food, goods and ideas. Most paths, or monopati as the Greek like to say, are as old as the monasteries, and probably older, from the pre-Christian era. These mountain paths are for walking only. But you can take your mule. 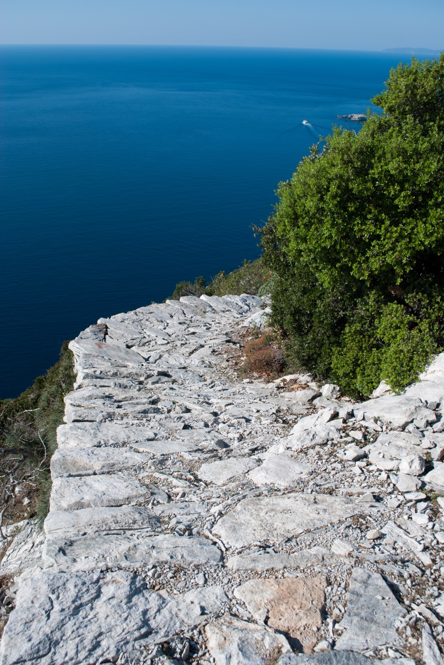 Sometimes these medieval foot paths are carefully placed stones, the path to the chapel of Nilos is even made of marble. In a clever, skilled design, as if an ancient wall is put to rest, horizontally. The marble stones fit like a complex jigsaw puzzle. The big ones are put to the steepest side. The use of marble is not too surprising because the entire Holy Mountain itself is made out of marble. 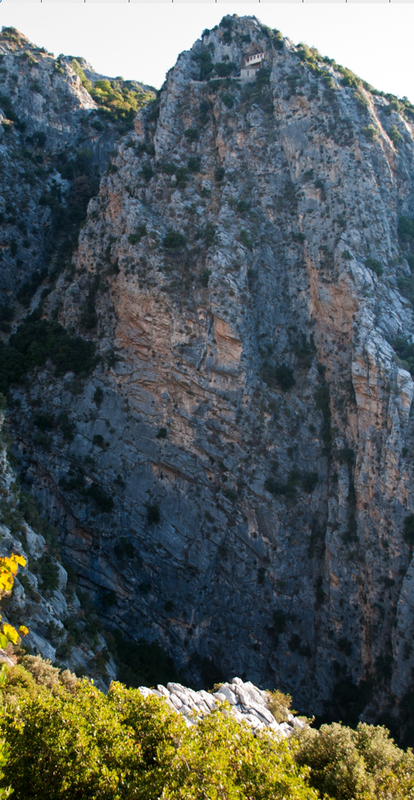 The path starts at the little settlement of Agios Nilos on a plateau with rugged olive trees. Then the path starts to go down. It is broad and bright. The sea is deep blue on your left hand side, hundreds of meters down. Not for those who suffer acrophobia. The path reflects in the sunlight. After a shower it will shine as if it has been polished. A clear white stripe will lead you in the moon light. A royal paved road to the cave of a humble hermit. 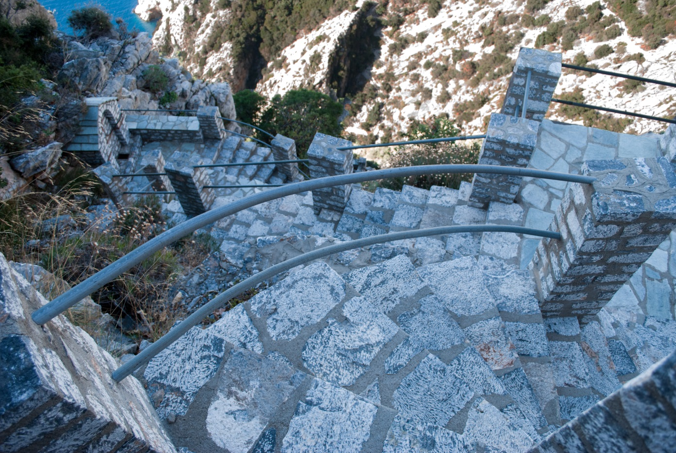 The path ends in a very modern and secured zigzag staircase going to the chapel. We found the chapel closed and locked. It seems to be build covering a cave. Here some information about the hermit who lived there. We did not find a human soul there. But there was fresh water from a well and a breathtaking view. From the opposite hill the chapel is hardly visible. It lies just a bit under what seems to be the top. The steep staircase is just left of the top. The cave with the chapel of Saint Nelios with the stairs on the right. This entry was posted in kellia, mountain, trip 2013 and tagged monopati, Nelios, Saint Nelios. Bookmark the permalink. Thank you for another report on St. Nelios on the Holy Mountain.